Papa Smurf or Smurf Santa? 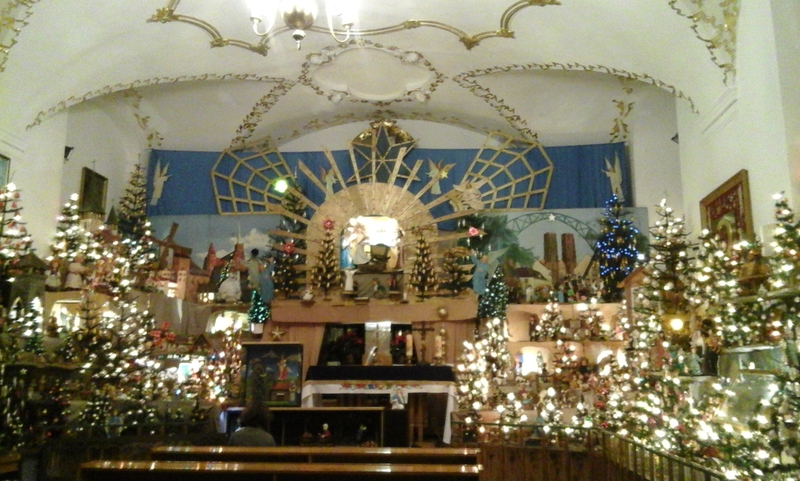 Around 2.000 toys collected and donated since the 70s recreate Jesus birth in Wroclaw along with 200 motors, in the church of Our Lady on the Sand. The Crib is a touristic attraction mainly for Polish, Germans and Italians. We always see Mary, Joseph, baby Jesus, the three wise men and the shepherds in the Christmas nativities. But Baby Jesus is born in Wroclaw on December 24th surrounded by an unlikely company: Papa Smurf, a witch on a broomstick, two hundred decorated trees, Santa Claus in a rocking chair, Polish typical dancers spinning about and Joan Paul II waving through of a window. As visitors enter the Nativity in the chapel for Deaf and Blind in the church of Our Lady on the Sand, a stern looking nun observes people. Frowning, this robust woman on a black habit guards the 2.000 pieces of this crib, this szopka, from the altar. As a watchdog she will bark if anyone dares to steal a toy or make fun of the montage. But this is just a disguise. If you donate some coins to the chapel she will kindly ask where you are from and she will hand out a couple of holy cards with the crib’s story, while an animated angel will bow to thank you. With a remote control, the nun activates both the lights and the movement in the szopka and the figures wake up suddenly. Then the woman presses another button and they move to some music. The crib has been open since 1967 and it exhibits what people might keep in a basement for several generations. 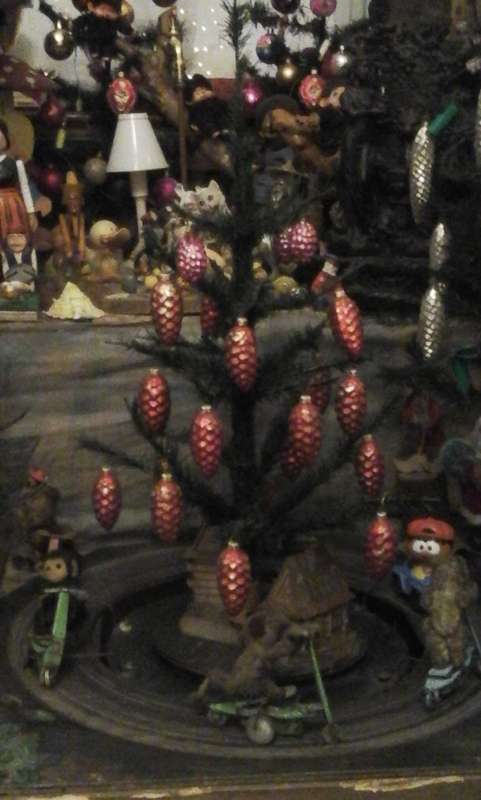 You see skinny and almost leafless Christmas trees from communist Poland, the yellow character from Sesame street in a seesaw, a train and a miniature car race track. A lot of these objects were collected and donated massively between the 70s and the 80s. “We are not collecting new toys anymore. The newest ones were collected during the kolęda visits, in 2013. 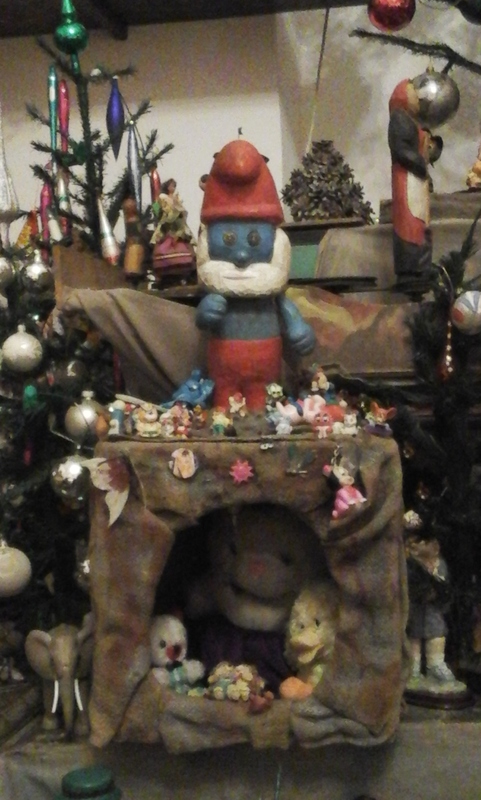 Children really wanted to give the toys to the crib and I couldn’t say no”, comments priest Tomasz Filinowicz, who is in charge of the montage of the crib and the administration of the chapel for Deaf and Blind today. Filinowicz is new to this job. From the late 60s and until his death, in 2012, it was priest Kazimierz Błaszczyk who gave life to the Nativity every year: in the early days he asked one of his friends to paint a mural of Wroclaw and he also decided that there should be animated figures in the Nativity. “The oldest ornaments are the mill, the church and the tower. It is very likely that father Kazimierz made those, and the nuns helped him paint them”, says Kazimiera, who has worked in the szopka for 30 years. A grandmother and a saleswoman, Kazimiera works with another woman and a man on the winter version of the crib. The three of them, under the direction of Filinowicz, start taking out the figures from the chapel’s basement at the end of September to wipe the dust away, clean them with water and soap, and if they are animated, put them in their right place. Because “people steal them”, says Kazimiera, who screws them down or glue them to the tables and shelves of the crib, year after year, along with her team. “It is an exhausting job. We need to be accurate and meticulous”, says, while spraying soap onto a toy that is wearing a typical dress from Kazajistan. The women place the prettiest characters, Angels or Santa Clauses, in a visible spot. The worn ones go behind: once during their annual cleaning and renovation work with the figures they put a black dog into the washing machine and discovered that it was actually white. “Where is my figure, where is it?” is a question often heard in this small chapel. Kazimiera and Jadwiga, the other woman working in the montage, have witnessed this scene several times. A man or a lady enters the room, studies the shelves, wonders where his donation is and “Ah, there it is!”, finds it. You could say the politics of the szopka is to preserve the memory of Polish childhood by not throwing away what it’s received. For instance, an old lighthouse that an old man made from matches and donated is still there. And although father Filinowicz announced that he will renovate the Nativity, he won’t dispose of the skeletal Christmas trees from communist times. “The new ones are more beautiful, but the old ones have some sentimental value”, says the father and adds that some figures have come to life thanks to the motors from radios and blenders from Communism. “Back in the 80s you couldn’t find anything in the shops. To animate a toy, you had to take the motor from other objects. Sometimes the toys is small, but the motor underneath is really huge”, explains the father. About 30 years ago in Wroclaw, the Sunday plan was to walk around the city, enter the church of Our Lady on the Sand and pay a visit to the szopka. Queuing in order to see the crib on December 24 th , even if it was below zero, was a must, from what Kazimiera says. Back then another scene was repeating itself, just as today among young families: the father or the mother tell their children, “when I was little I came here with my mother (or father), and father), and today I am here with you”. Father Filinowicz expects to renovate the szopka in the next years. In order to renew it, they will remove some toys but they will keep the most distinctive ones. Will this Nativity continue to be a paradise for old toys? A big thank you to Aleksandra Burghardt and Ewelina Cembrynska for their help behind this story. *This story was published in Polska Viva, in 2014.